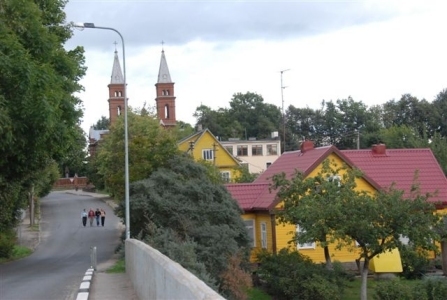 Uzpaliai, known to our ancestors as Ushpol, is a small village in the northeastern corner of modern-day Lithuania. Its one of those towns that you would barely notice as you passed through. But it was once home to several hundred Jewish people, my family among them. I hope to provide some information about Ushpol, so that the Ushpol that once was, might exist again, at least in our memories. If you have any comments or materials to share, please contact me. Where Once We Walked by Gary Mokotoff and Sallyann Amdur Sack. Teaneck, NJ: Avotaynu, Inc., 1991. YIVO - Documents from YIVO's Record Group 2, Collection of Lithuanian Jewish Communities. The Encyclopedia of Jewish Life Before and During the Holocaust, Editor in Chief Shmuel Spector, Consulting Editor Geoffrey Wigoder, New York University Press, New York, 2001. This statue is in the middle of town, with the church on one side and the town hall on the other. 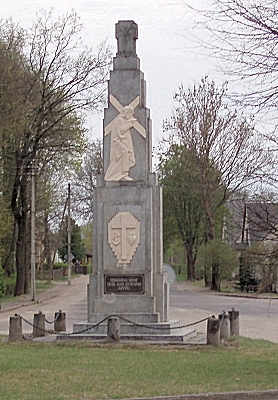 The statue is dedicated to a Lithuanian hero. When the Russians captured Lithuania they destroyed and removed anything related to Lithuanian nationalism. In an attempt to save the statue the townsfolk asked Meir Yitzchak Shapiro, a great uncle of Arky Berkal, if he would store the statue in his store. He did and eventually the statue was restored to its place of honor. Maps.lt - Digital Map of Uzpaliai, showing all the streets and building locations of modern Uzpaliai. Select "cities and villages," then type in Uzpaliai and, finally, select 'map' for a street map or 'ortophoto' for a satellite view. Click here to see some of those views. This site is hosted at no cost to the public by JewishGen, Inc. and is part of the ShtetLinks Project. If you find this site of value, your JewishGen-erosity is greatly appreciated.